Tyson Foods recalled 2.5 million pounds of chickens last week due to a mislabeling error. A supplier allegedly forgot to disclose milk as an ingredient in breading that they put on the body parts of chickens they kill. The reaction from the media and USDA has been lifeless. News stories simply notify readers of the recall with no mention of the needless suffering and waste. 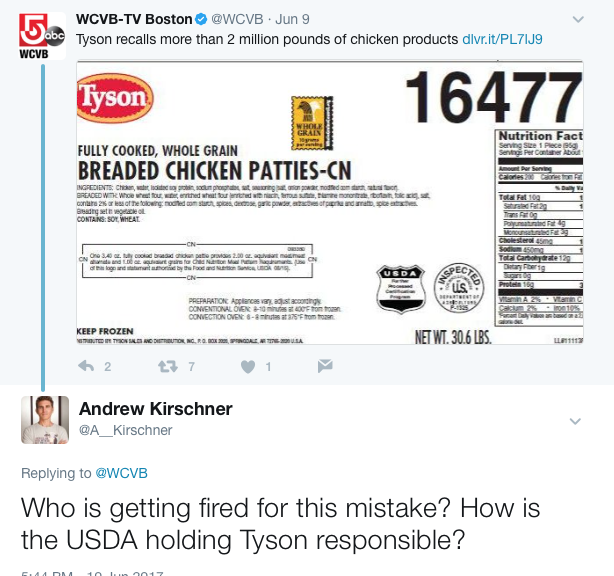 Most media outlets have not covered how it happened, why it happened, who should be fired for the mistake, or how the USDA will hold Tyson and its suppliers accountable for needlessly killing all of these animals. Of course, farm animals are always killed for no justifiable reason because people don’t need to eat chickens to survive but it’s especially egregious to kill this many chickens and then throw them in the garbage. Recalls provide yet another reason to eat plant-based meat. When there is a mistake at a plant-based food company, it costs the company making the error money; it doesn’t cost lives. Please consider expressing your outrage. Contact the USDA at (202) 720-2791 and leave a message or contact the USDA or Tyson Foods on social media. You can also ask media tweeting the recall to investigate and write a story that may lead to accountability and prevent future mistakes that tragically end so many animals’ lives. Farm animals like chickens feel pain and suffer just like your family dog or cat would under these circumstances.